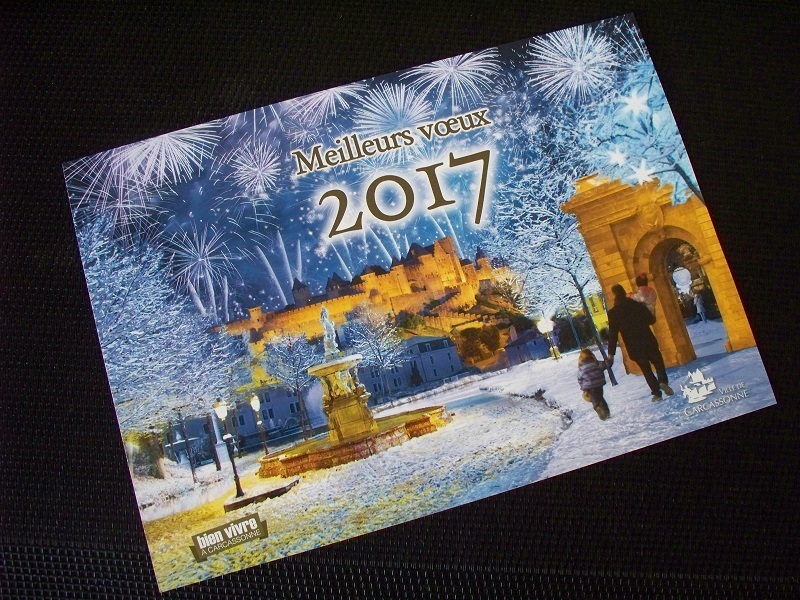 We got a postcard on Friday from the mayor that said Meilleurs Voeux 2017 that we might otherwise recognize as Best Wishes for the new year. On the other side of the card that you see here is his greeting wishing us a happy new year and thanking us for our confidence in him and in our city. In all of the places that we’ve lived, I don’t remember ever getting a card like this before—a tax bill, jury duty summons, or a zoning change, sure, but nothing nice like this. Looks like 2017 is getting off to a great start in Carcassonne! Posted on January 2, 2017, in Dealing with government, Life in France and tagged Americans in Carcassonne, Carcassonne, Community. Bookmark the permalink. 3 Comments. How great for you guys! I don’t doubt that you found the best place to live! The card is lovely. In my little town, the mayor has invited everyone to a kind of best wishes ceremony on the 14th January at 15h, followed by galette des rois for all! It should be fun. Sounds like our kind of town!